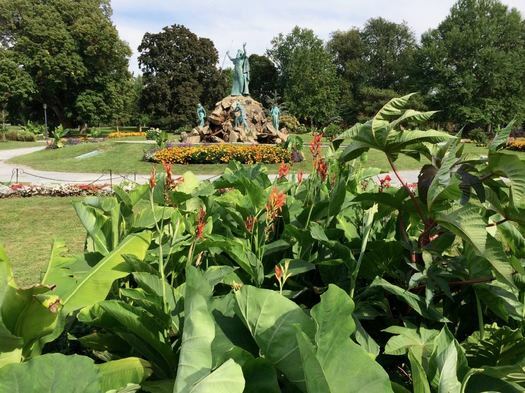 City gardener Jessica Morgan said she stopped by Washington Park about two weeks ago and noticed that someone had stolen a 25-year-old rubber plant from one of the beds there. "Plants like that are quite expensive," she told us, estimating the plant was probably worth at least $800. 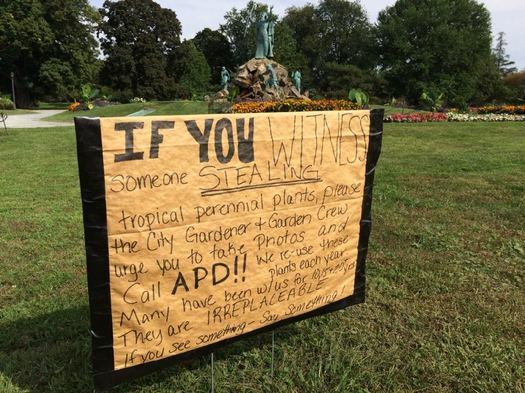 She figures at least $2,500 in tropical plants have been stolen from city beds this year. So the gardening crew put up a sign asking members of the public who see anyone ripping out plants to snap a pic and report it to the Albany police (518-438-4000). 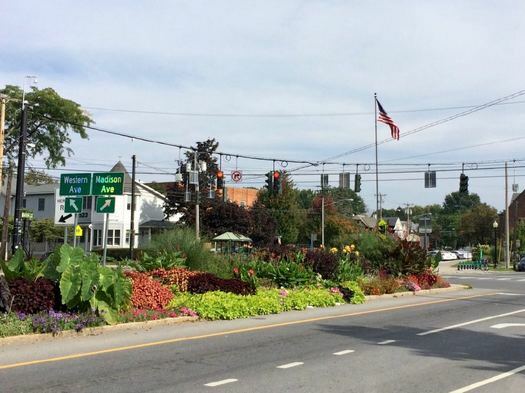 The city has a collection of tropical/warm climate plants that it reuses each year in the Washington Park beds and the medians on Broadway and at the Madison Ave/Western Ave merge. The species includes elephant ear plants, hibiscus trees, rubber plants, dahlias, and an assortment of ornamental grasses. The plants spend the summers outside, and then overwinter in the city greenhouse because they can't survive cold temperatures. Morgan, who's been working with the city for 15 years, figures some of the plants are 30 years old. "A lot of the stuff we really try to hang onto," she said, adding that reusing the plants saves money and allows the city to fill out the summer displays in the park each year. "It's one of the things that makes Washington Park special." So not cool. But very interesting to know that the plants are reused! The city gardeners do a beautiful job with the park (kudos Jessica!) I always appreciate the different plants around the park and the city during the various seasons. The older plants date back to when Peter Rumora was involved with the Park's gardens (and the Washington Park Conservancy). He was our neighbor back then and his own backyard was enchanting. Very interesting! I always was a bit curious why Albany had so many tropical plants during the summer. It's so cool to know that they're preserved in greenhouses during the winter. I especially love the rubber plants. Word to the wise, you can buy elephant ear bulbs at hardware stores all over this area for pocket change. They are fairly easy to grow.